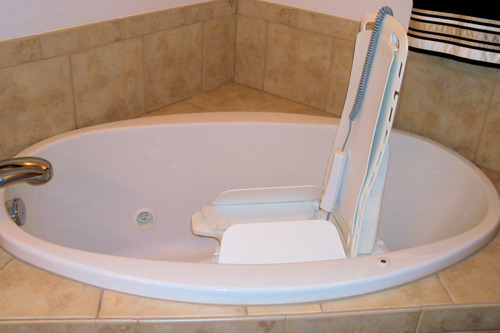 REVIEWS: See what those who bought it have to say about this bath lift. 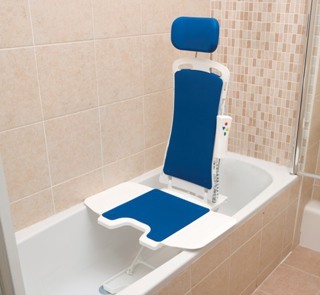 The Bellavita bath lift chair happens to be among the lightest bath lifts in the market weighing only 20. 5 lbs (9.3 kg). At 2. 3″ it is also among the lowest. The seat height reaches 18. 8″ making it excellent for deeper model tubs. The backrest reclines to about 50 degrees at its lowest position (watch the video below). Setup is easy and tool free and the hand controls are water resistant The lithium-ion battery of the unit is in the Hand Control. Two piece construction makes the lift easy to assemble/disassemble for transport. When not in use, back easily folds down for space-saving storage. The Padded seat and backrest provides added comfort. Washable covers are available in white, blue or grey. Headrest available as an optional extra. 308 lbs (140kg) weight capacity. 2 years guarantee on battery/handset. Lifetime Warranty on frame & motor. It makes a clunking noise when carrying a very fat person. This bath lift chair had the best reviews out of all that I sampled. The only key negative to this product is the fact that if you are very tall, you need to have a longer tub so that there will be more leg room. But if you are not very tall I recommend it as an excellent and long lasting buy. You should read more reviews so that you can see what others who bought this chair think about it. The best alternative for this bath lift seems to be this one.